Is your heating or cooling system set at one constant temperature? 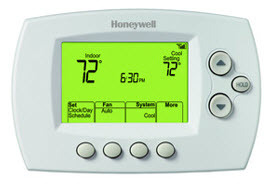 Easy-to-Use Programmable Thermostats are available through UCONS and we’ll be happy to install for you as well. Programmable thermostats will allow you to adjust your homes temperature when you are asleep, or away or when it’s cold or warm outside. This will help reduce your utility bill.